Why do governments only ever quote statistics that mislead? Misleading information from the IDS schoolroom: In Iain Duncan Smith’s world, anyone without a job is a scrounger, never mind if you’re between engagements, have plans that you’re following through or have simply fallen on hard times. He makes no exceptions. I’m getting tired of writing about this goon. I suppose I should apologise for harping on about him, but Iain Duncan Smith has done it again! Today he has been banging on that it is unfair for benefits to rise at a faster rate than wages. He used percentages to support his claim, saying jobless benefits have risen by 20 per cent in the last five years, compared with an average 12 per cent rise in private sector pay. Smith is trying to get you to think that the jobless are making more money than working people, and those figures are probably enough to fool the unwary television news viewer or radio listener. But what happens when we use actual amounts of money to illustrate this? According to financial journalist Paul Lewis on Twitter, this means unemployment benefits have risen by just £11.85 per week, while average private sector pay has risen by £49 a week. How’s that difference looking now? Bear in mind that inflation over the last five years was 13 per cent – for everyone – and you’ll see that nobody is making a killing here. IDS is living in a world of his own, though. He’s arguing for a cap of one per cent on benefit rises, for the next three years – effectively removing six per cent of jobseekers’ income by the end of that period. Don’t forget, the bedroom tax is coming into play in April, when Council Tax Benefit is abolished. The benefit cap is also being introduced this year, and Universal Credit is due to needlessly complicate matters further in October. If you are affected by any of these, make no mistake: Iain Duncan Smith and his government want to make you destitute and put you on the street. It won’t matter if you voted Tory; they fooled you then and now they’ll throw you into the gutter without thinking twice. That’s what these figures mean. or in plain English, ‘lies’. This man is showing off his “looney” stripe more and more, don’t stop writing about him Mike, however fed up you get. He needs as much exposure as he can get. “Someone is coming to take him away ha-ha, they’re coming to take him away”, the only way to make that happen is to heap as much pressure on him as we can, so far it is working-his rants are becoming more and more ridiculous at each passing day and it will be us coming for him. This is the gamble, Joanna, but we have little to lose by encouraging Mike’s tireless counterblasts to the lunatic in question. By the same logic, I wonder whether ‘The Guardian’ newspaper publishes his mad-but-putrid out-frothings with this in mind. I know the paper receives its fair share of criticism, largely for flag-waving on behalf of the conDim coalition, but unless it has turned a rabid shade of blue in the last year, I find it hard to not believe that every publication and pseudo-justification the demented pervert IDS offers is another bullet in his own foot. The real question is: Why isn’t the Labour Party, in particular Liam Byrne, taking IDS and his bully boys to task in the same way as bloggers do in a similar way to this one? Why aren’t high profile politicians, who spend a lot of their time talking to journalists, saying things like this and drawing attention to the distortions and lies perpetrated by utterly dishonourable characters like IDS, Osborne, Cameron and Shapps (the scumbucket of scumbuckets)? I have given up expecting a counterblast, or polite rebuffal from Ed M, to correct the lies spewed out by IDS. He knows he can say whatever he effing-well likes to whip up the frenzy of the hard-of-thinking brigade, in the sound knowledge that John Humphrys or his ilk will not take him to task, and nobody else will contest his lies in a loud voice. I’ve removed a comment from Nigel. It contained a graph apparently showing levels of Jobseekers’ Allowance between 2007 in comparison with average wages. 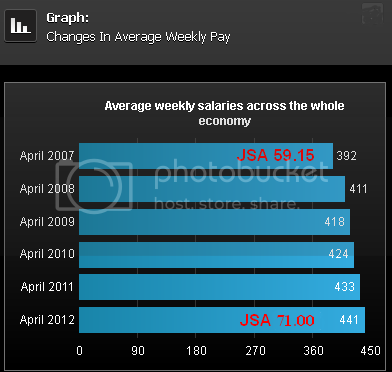 Unfortunately the level of JSA shown for 2012 does not appear to be accurate. Nigel put it at £77 and change. The figure widely quoted today was £71 – which tallies with the comment by Paul Lewis in the article, as the level of JSA shown for 2007 is £59.15. I haven’t checked the figures for the average salary. These figures tally up. Interestingly enough, if you divide average wages by the level of JSA in both years (2007 and 2012) you get very nearly the same figure – 6.2 – meaning that JSA as a proportion of average salaries has not changed at all. The FactCheck article is okay as far as it goes, but it doesn’t go far enough. Did you spot the comment from ‘Mike Sivieer’ (damn these self-inflicted typos!) pointing out the difference in actual money terms? Also a note that benefits have remained stable as a proportion of wages, at around one-sixth, and that Smith wants to wreck that, would have been welcome. So it’s flawed, not final, I would say. Will they now take this further and out the people most guilty of this?